Dubai, For one Kuwaiti Sony PlayStation gamer, a dream has come true. Earlier this week, 27-year old Ahmad El Azmi from Kuwait City flew to Japan and got behind the wheel of the real Nissan GT-R. All courtesy of Nissan Middle East and PlayStation. Back in July Ahmad 'raced' the virtual Nissan GT-R against regional finalists at Dubai Festival City to become the inaugural winner of the Gran Turismo™5 Prologue Middle East Challenge, staged by PlayStation in association with Nissan Middle East The event saw over 10,000 competitors 'race' in nine regional cities across the Middle East during June and July 2008. Race virtually and win in real life. Although virtual racing, does not equal real life racing. 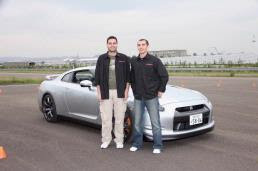 In addition to the hardware, Nissan and PlayStation arranged for Ahmad and a friend to fly to Japan and attend a major gaming show in Tokyo and then travel on the Nissan's Oppama manufacturing plant and test track, to drive the real Nissan GT-R super car.